– International Journal of Sports Physiology and Performance, 2012, 7, 130-140 © 2012 Human Kinetics, Inc. This study investigate whether contrast water therapy (CWT) assists acute recovery from high-intensity running and whether a dose-response relationship exists. 10 trained male runners completed 4 trials, each commencing with a 3000-m time trial, followed by 8 × 400-m intervals with 1 min of recovery. CWT, by alternating 1 min hot (38°C) and 1 min cold (15°C). 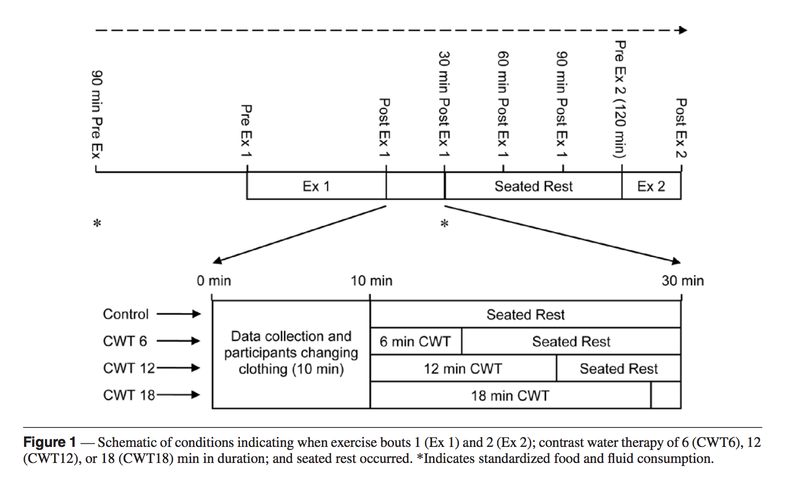 The different intervention performed either a 6 min, 12 min or 18 min (CWT) compared with a seated rest control trial. The 3000-m time trial was repeated 2 h later. Rating of perceived exertion (RPE), effort, and motivation were recorded after each time trial. The RPE was on a scale of 6 (no exertion) to 20 (maximal exertion);29 effort and motivation were rated out of 100% (maximal). 631 ± 4 to 647 ± 4 s in CWT18. There were no substantial differences between conditions in exercise heart rates. Algometer thigh pain threshold during CWT12 was higher at all time points compared with control. Data for CWT6 and CWT18 are based on nine participants. Thigh pressure-to-pain threshold was higher in CWT12 compared with control at all time points. Subjective measures of thermal sensation and muscle soreness were lower in all CWT conditions at some post-water-immersion time points compared with control; however, there were no consistent differences in whole body fatigue following CWT. 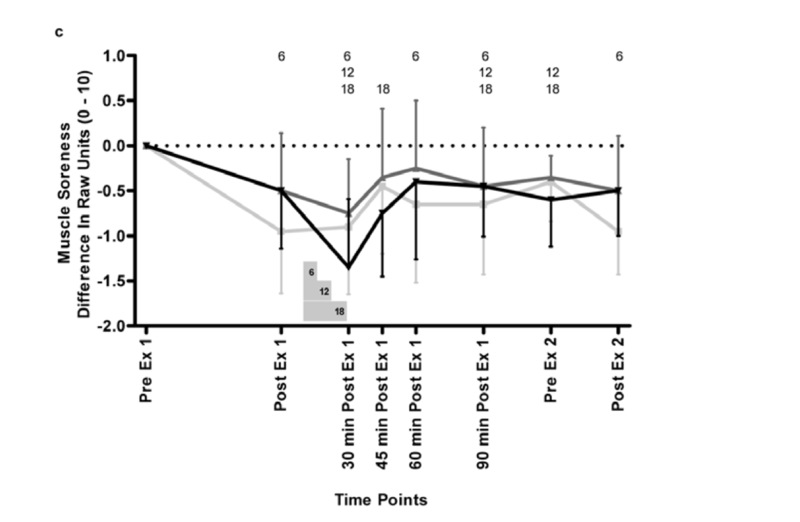 Contrast water therapy for 6 min assisted acute recovery from high-intensity running; however, CWT duration did not have a dose-response effect on recovery of running performance. The participants were asked to provide these rankings based on their experiences during the study; however, their existing beliefs are likely to have influenced their responses. The participants existing beliefs could also explain why 6 of 7 participants would prefer to use CWT of any duration over no intervention. The possibility of a placebo effect in the present study is acknowledged. However, in studies of this type, it is virtually impossible to blind the participants and researchers to the water temperatures and immersion durations. Effort and motivation during the 3000-m time trials were measured, as they are factors that can influence exercise performance. However, here the participants reported few differences in effort and motivation between conditions; therefore, any differences in performance are unlikely to be due to these factors. 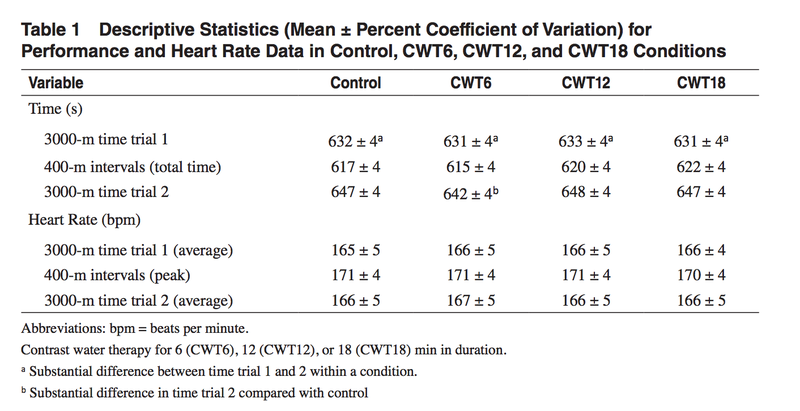 The findings of the present study suggest that performing postexercise CWT for 6 min might accelerate subsequent 3000-m time-trial running performance 2 h later; however, a dose-response relationship does not exist between CWT duration and recovery of running performance. Performing CWT for 12 and 18 min did not accelerate recovery when exercising outdoors in cold environmental conditions. The effect of performing CWT on subsequent high-intensity running performance in warmer environmental conditions is unknown and requires further investigation.